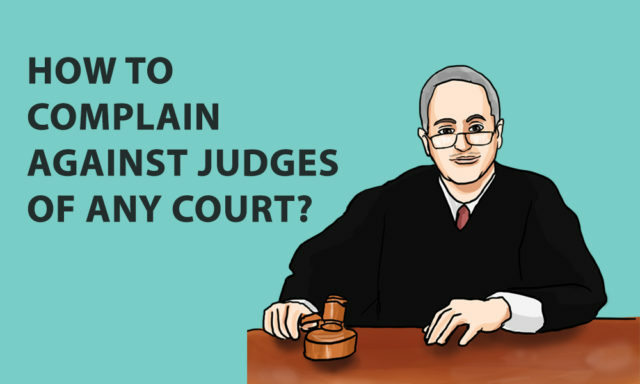 Home Articles Legal Articles How to file complain against Judge of any Court? How to file complain against Judge of any Court? Anyone cannot complain against the judge for an unfavorable judgment or order. For that case there another choice such as the provision of revision, review, or appeal to higher judiciary. 1.Whether you felt that the judge was rude towards me because. 3. That appeared as if the judge had fallen asleep during the hearing. Another type of example of non-judicial or irresponsible conduct of the judge: A husband reported that judge in a domestic violence act maintenance case threatened in open court to husband to call of the wife or the high interim maintenance order will be given by the judge. Fact on the above page is quite reasonable, so one can adopt a similar broad format to send complaint and mention as much detail as possible. Anyone can repine if you are not happy with a judge, magistrate, tribunal member’s behavior, language, conduct and you must make your complaint within 3 months. Whether the complaint is against subordinate judiciary then send to Registrar, District administrative judge. Whether it is High Court judges then CJ of HC. SC judges then CJI of SC and if CJ HC then sent to CJI himself. The Department of Justice (DOJ) receives a large number of grievances from citizens through an online CPGRAMS portal and on e.Mail of the officers. The DOJ also accept grievances through Presidents Secretariat/Vice Presidents Secretariat/PMO/Department of Administrative Reforms & Public Grievances/other Ministries/Departments & also right away. While the majority of the grievances are related to the judiciary, grievances relating to other Ministries/Departments in the Central Government and pertaining to State Governments/Union Territories are also sent to us. The Grievances related to the judiciary are forwarded to the Secretary-General Supreme Court of India/Registrar General of the concerned High Court for further action, as needed. 3. If any grievance related to verdicts of the Courts are not handled as a grievance. Such grievance holders are advised to seek the proper legal remedy in the appropriate Court of Law as per rules. The Grievances relating to Judges of Supreme Court are forwarded to the CJ of India and grievances related to Judges of the High Courts are forwarded to CJ of the concerned High Courts for appropriate action. Settlement of pending cases in courts is within the domain of judiciary, which is an independent organ of the state under the constitution of India. 6. Among the case of any representation relating to the undue delay in judgment or evil judgment or miscarriage of justice, the petitioner is advised to resort to judicial remedy by repletion an appeal or any other proceedings before the appropriate Court of Law within the time limit. 7. Kind of the guidelines issued by the SC of India related to grievances/complaints against members of the Subordinate Judiciary, it is clarified that such grievances are to be accompanied with an apropos sworn affidavit and verifiable material to substantiate the allegations made therein. Representation holders are advised to send the grievances pertaining to the Supreme Court/High Courts directly to them. Representation forwarded by the Department of Justice is deliberated & verified by the Judiciary as per their own in-house mechanism and the system/procedure to deal with grievances which are normally not shared. There, the Department of Justice is not in a position to inform the outcome to grievance holders.